The following Conejo Valley locations take part in a program that provides year-round meals on designated nights of the week to individuals who are in need. And from December to March, both dinner (6:30 pm) and overnight shelter is offered. This information is current as of May 2018. Subject to change. Call in advance to confirm. Sleeping facilities for up to 15 people during winter months. Visit www.htlcto.org/causes for more information. Hot dinner at 6:30pm year-round. Visit calvarycc.org/basic-needs for more information. Dinner at 6:30pm year-round. www.wpcwestlake.org/index.php/missions/neighborhood Hot meals at 6:30pm Wednesday nights year-round. Visit www.umcto.org/outreach#. Meals at 6:30pm Friday nights year-round. 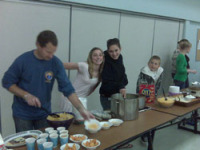 Meals served for up to 50 people and shelter for up to 30 during winter months. Dinner at 6:30pm on Saturday nights year-round. Meal and overnight site from December-March. Hot meal for 50 to 80 people. Overnight accommodation for 20 to 35 people.